Daniel Kaffee (Tom Cruise), son of the late Lionel Kaffee (who held the positions of Attorney General and Navy Judge Advocate General), is an inexperienced U.S. Navy lawyer who leads the defense in the court-martial of two Marines, PFC Louden Downey (James Marshall) and LCpl Harold Dawson (Wolfgang Bodison), who are accused of murdering a fellow Marine of their unit, PFC William T. Santiago (Michael DeLorenzo), at the Guantanamo Bay Naval Base in Cuba. 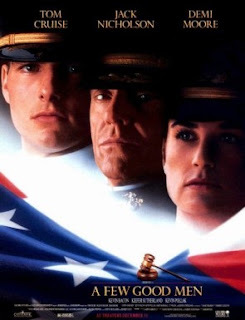 When Dawson and Downey are later arrested for Santiago's murder, Naval investigator LCDR JoAnne Galloway (Demi Moore) suspects that they, who were top-class Marines compared to Santiago, were carrying out a "code red" (a euphemism for a hazing procedure by which a Marine who fails to keep up to standard is "trained" by other members of his unit until he is up to it). Kaffee's plea-bargaining methods would have prevented the case from ever going to court and causing embarrassment to the Marine Corps and potentially mar Col Jessup's chances of advancement, since he is being considered for the position of Director of Operations for the National Security Council. Kaffee has never even been to court (except as a defendant when his driving license was suspended) and thus can devote himself to his passion of softball. He also lives in the shadow of his late father Lionel who is considered one of the greatest trial lawyers of his time. In court, Kaffee questions Jessup and produces circumstantial evidence that does suggest that there was never any intention of transferring Santiago off the base. When this proves to be insufficient, Kaffee confronts Jessup regarding the incompatibility of his ordering Santiago's transfer (ostensibly for his safety from hazing) with his assertion that he ordered that Santiago was not to be touched and that his orders were always followed. When Kaffee asks Jessup point-blank, "Did you order the Code Red?" the judge announces that he is in contempt of court. However, Jessup cannot resist the challenge. Kaffee exclaims "I want the truth!" and Jessup declares emphatically, "You can't handle the truth!". Because he defends his country, Jessup does not see why Kaffee, who has never seen action, should question his methods: "I have neither the time nor the inclination to explain myself to a man who rises and sleeps under the blanket of the very freedom I provide, and then questions the manner in which I provide it. I would rather you just said 'Thank you' and went on your way." Santiago's death "while tragic, probably saved lives." Pressed by Kaffee, "Did you order the Code Red? ", and furious that he has to hide what he views to be necessary conduct, Jessup bellows "You're goddamn right I did!" m looking fwd for this movie ill relly watch this movie! :) it comes a lot on bindass movies these days,... and its also there with Z studios dude... do check the news papers and I hope u will be able to catch it in a week time! har hafte it comes :) awesomeeeee ! !